• Anti-kink sleeve prevents hose pipe from flattening when inverted from a cylinder or header tank. • Securing bracket prevents hose pipe from moving when inverted from a storage tank. WHEN USING SYPHON SUCKER TO REMOVE WATER FROM CYLINDERS, THE 1” B.S.P FITTING MUST BE REMOVED FROM THE OUTLET FIRST. THERE MUST ALSO BE ADEQUATE WATER VOLUME WITHIN ANY STORAGE TANK OR CISTERN FOR SYPHON SUCKER TO FUNCTION CORRECTLY AND REMOVE VIRTUALLY ALL CONTENTS OF WATER. 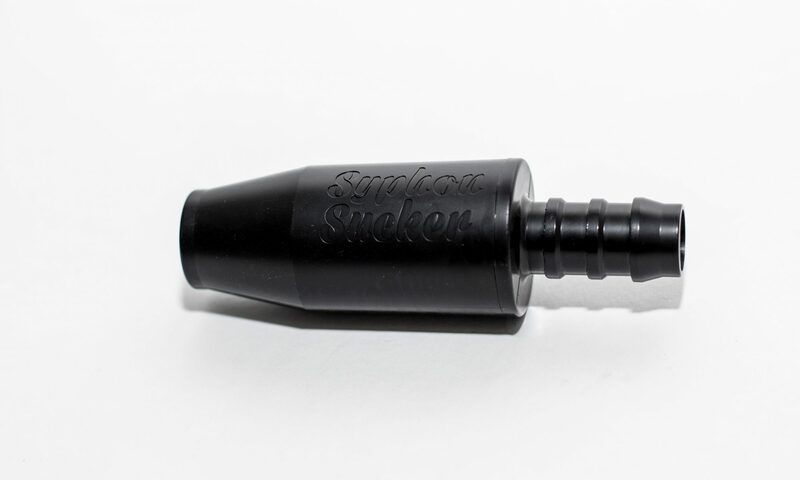 SYPHON SUCKER MUST BE USED IN A FULLY VERTICAL POSITION, NEVER HORIZONTAL OR INCLINED. Place anti kink sleeve over hose pipe (approx. the height of cylinder or height of storage tank). Attach syphon sucker to hose pipe and secure with cable tie provided to prevent seperation during shaking action. Adopt a repetitive upward / downward shaking action until water volume is visabily reducing from the equipment being syphoned. Support hose pipe using anti kink sleeve provided when using on cylinders only and support hose pipe using anti kink sleeve with the stability bracket when using on storage tanks. (it may be necessary to make two small cuts on the tank lip using a junior hacksaw and fold over for the stability bracket to be upright). On completion of syphoning, remove hose pipe and turn upside down to remove any drain back fluid remaining within hose pipe. Disconnect syphon sucker and any of the associated accessories from the hose pipe and rinse under fresh running water to ensure internal mechanism is kept clean.